The Cuthbertson Laird Group is one of the UK’s largest providers of calibration services. Boasting first-class calibration laboratories in England, Scotland and Northern Ireland, Cuthbertson Laird supply both UKAS and National Traceable certification across a range of disciplines. The Group holds approved Repair Centre status from many leading manufacturers and is able to undertake the maintenance and repair of a comprehensive range of test and measurement instruments. The all-inclusive nature of the services offered by Cuthbertson Laird ensures that its growing customer base regards the Group as an extremely efficient ‘one-stop-shop’ supplier. To ensure that cost effective prices are charged for calibration work and that customers are able to receive their instruments back in as short a time as possible, Cuthbertson Laird utilises a wide range of technically advanced, highly efficient calibration equipment. Cuthbertson Laird Managing Director, Peter Greenshields explained, “Our service includes a prompt collection and delivery provision, detailed certification with full results included and guarantees on all of our work. “To make certain of the highest standard of precision in all of our calibration procedures, and to enable the on time throughput of work in our calibration laboratories, we use the most up to date, highly efficient calibration equipment. Not only does this policy guarantee the accuracy of our processes, the efficiency of our calibration operation means that we are able to charge very reasonable prices and that our customers are able to receive their accurately calibrated instruments back very quickly.” Typical of the Cuthbertson Laird Group’s policy of investing in the best available calibration equipment is the recently purchased Trimos Labconcept calibration machine. For more than 40 years, Trimos has offered a wide range of high precision products and advanced solutions in the field of dimensional metrology. The renowned company’s products are developed and manufactured in Switzerland and are internationally recognised for their excellence. Available in the UK from Bowers Group, the Trimos Labconcept represents the latest developments in the field of multifunction calibration machines. 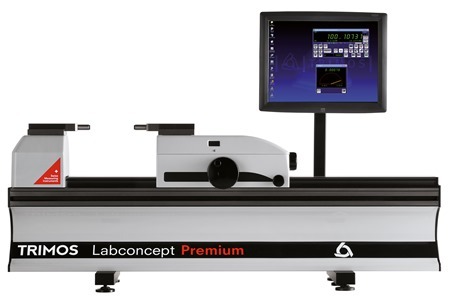 Capable of calibrating an extremely wide range of dimensional measuring instruments with impressive speed and accuracy, the Labconcept is now the calibration machine of choice for some of the largest UKAS laboratories and in-house calibration facilities throughout the UK. The Labconcept Premium makes use of QMSOFT (Quality Management Software), a comprehensive, user-friendly gauge management software programme. QMSOFT enables the effective management of commercial calibration laboratory gauge throughput. Specially developed modules make possible the calibration of all common dimensional gauges using any national, international or user defined standards. When relevant modules are installed, all gauges’ normal sizes and tolerances are calculated by the program. The automatically generated inspection / calibration certificates can be customised and saved as html, doc or pdf files. Peter Greenshields continued: “As the growing workload of dimensional calibration in our Hamilton laboratory was beginning to put a strain on our existing resources, we recently investigated the available modern calibration machines. Having carefully considered the merits of the options available, we deemed the Trimos Labconcept to be the best choice for our demanding needs. “We make our living by calibrating and repairing a wide range of electronic and mechanical devices, therefore when it comes to buying this kind of equipment we are an extremely discerning customer. After a rigorous assessment, we found the Trimos Labconcept to be a dimensionally stable, first class calibration system that was able to deliver both the high-precision and the speed of use that we need in our Hamilton facility. “The Labconcept’s impressive productivity is helped by the wide range of quick-change accessories and holders that were supplied with the machine, as they allow us to accurately calibrate a wide range of measuring instruments. In addition to a variety of hard gauging such as plain and threaded plug and ring gauges, we are also able to calibrate an assortment of instruments, such as analogue and digital indicators, transducer probes and micrometers. “In addition to the Labconcept’s easy to use QMSOFT software giving access to all relevant national and international gauge standards, Bowers will also provide us with all future software updates. QMSOFT has also enabled us to configure calibration certificates to our own in-house format. Rather than our clerical staff entering calibration values onto a calibration certificate, the highly automated nature of the Labconcept means that at the end of a calibration procedure, a comprehensive calibration certificate is instantly generated. Due to requests from some of our customers, we now offer the option of an 'electronic copy' of the calibration certificate, which is downloadable from our website direct to any PC. Although hard copies of the certificates will still need to be kept and produced for inspections etc. For more information on the Trimos Labconcept Premium click here.